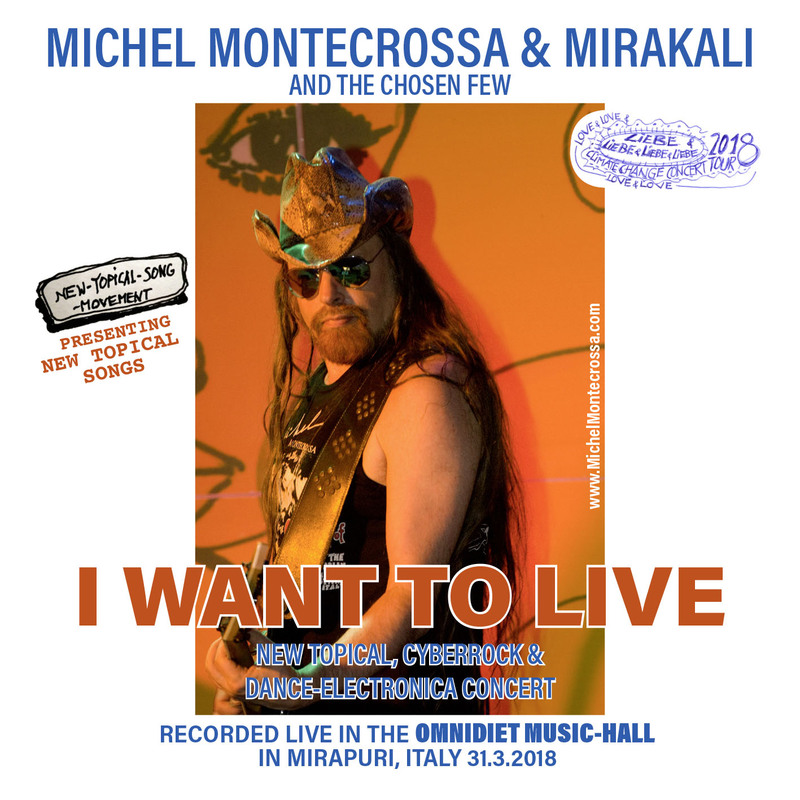 ‘I Want To Live’ New-Topical, Cyberrock & Dance-Electronica Concert by Michel Montecrossa, Mirakali and The Chosen Few live in the Omnidiet Music-Hall in Mirapuri, Italy on 31st March 2018, is released by Mira Sound Germany on Audio-CD, DVD and as Download. 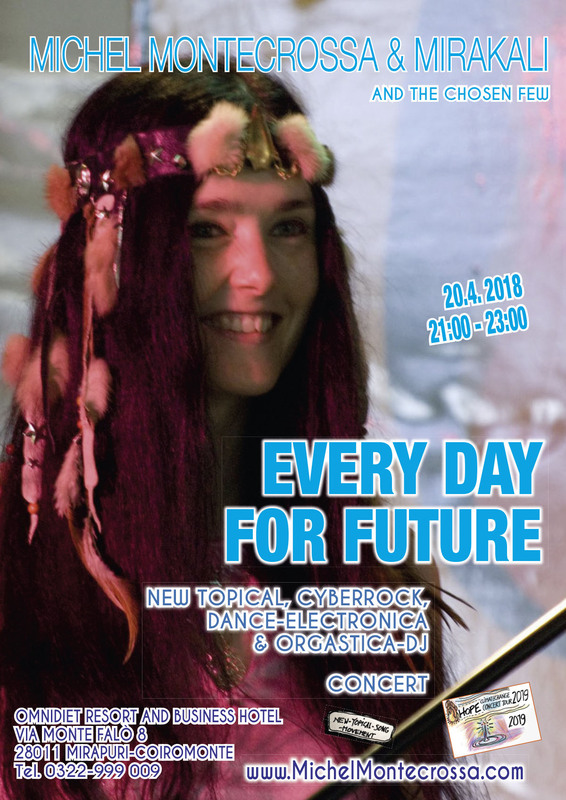 The concert presents 35 no-establishment songs by Michel Montecrossa and Mirakali including: ‘Talking U.S.A. Kids Don’t Want To Be Killed’, ‘I Want To Live – Ich Will Leben’, ‘Song For The Festival Of Love’, ‘Your Bliss’, ‘Cyborg Girl & Cyborg Man’, ‘Mondkuss Lust – Moonkiss Passion’, ‘Careless Like A Child’, ‘Große Liebe – Großer Frieden! Big Love – Big Peace!’, ‘Musing Dream’, ‘Good Words From A Good Man’, ‘Neues Ziel – Meine Liebe Und Herzlichkeits Welt’ and many more. This entry was posted in Acoustic / Unplugged, Art Photos / photos of paintings, Concert Videos / Konzertvideos, Cover Art / Poster Art, Cyberrock, Cyberschlager, Dance, Electronica, German & Bilingual English/German songs, Live Concert, Love & Love & Love & Love Climate Change Concert Tour 2018, Messages & Quotes, Michel Montecrossa, Michel Montecrossa Music Styles, Mirakali, Mirapuri & Miravillage, Movie / Video, Neuerscheinungen & News, Orgastica-DJ, Photo Art, Photos / Fotos, Posts, Social Climate / Climate Change and tagged ‘I Want To Live’ New-Topical Cyberrock & Dance-Electronica Concert, Concert Preview, Electronica, Listen, live album, Michel Montecrossa, Mirakali, Mirapuri, New Topical songs, Omnidiet Music-Hall. Bookmark the permalink.